Matte. I'm not going to lie, I love matte finishes. In this case, beauty products. I am always on the lookout for matte foundations. When a new matte foundation emerges into the market, you best bet I NEED to give it a try. The COVERGIRL Clean Matte BB Cream was no different. I was intrigue to test this product out to see if it would work well for someone with combination skin, because I technically have oily skin, right?! I may not have oily skin entirely but my face does get a bit oily around the t-zone area. The BB Cream did a wonderful job in the coverage department. 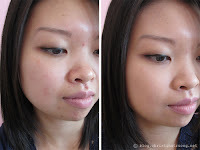 A buildable coverage not only evened out my skin tone but covered the blemishes around my face. Even with a few minor dry patches around my face, the BB Cream did not make them noticeable. It provided a lightweight, smooth, matte finish. By the end of the day, my skin still looked mattified with a tiny bit of oil peaking through the tip of my nose. Other than that, I am very pleased with the COVERGIRL Clean Matte BB Cream as it did what it claimed. Available in 6 shades (510 Fair. 520 Light. 530 Light Medium. 540 Medium. 550 Medium Deep. and 560 Deep), I highly recommend this to anyone who wants a lightweight, buildable, matte finish and especially those with oily skin. Want to give COVERGIRL Clean Matte BB Cream a try? Download this coupon and save $1 one any COVERGIRL product. Then, let me know your thoughts on this product.